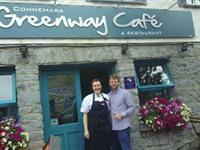 There are loads of places to eat in and around Oughterard, Moycullen, Galway and Clifden. 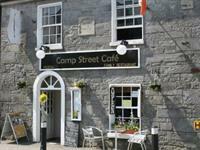 We are a small Restaurant, Café and Deli situated on the main street in Oughterard serving fresh homemade meals, cakes and breads with wines and beers. We stock a great selection of craft beers for dedicated craft beer makers form near and far. Our wines are carefully selected from small suppliers who share our ethos. Local honey, crunchy granola, free range eggs, creamy porridge or crispy local Connemara bacon and sausages with locally made black pudding, whichever way you want to start the day, we guarantee it will be with the freshest of local ingredients. Each day we prepare lunch on the go; a lot of the dishes will depend on what’s good and on season. There’s always our Connemara Seafood chowder, a choice of super salads and more hearty choices to set up the rest of your day. During the summer months we push the boat out with our inventive and indulgent evening menu. On a lovely evening watch the sun set in the west, enjoy the company of friends or strangers and enjoy a relaxed evening in comfort. Welcome to the Camp Street Cafe & Pizzeria! We’re a family-run Cafe, Restaurant, Take-away, B&B and Caravan Site… yes, we’re a bit busy!